Vijay’s Mersal is one film which is being awaited all over. The film is titled Adirindi in Telugu and was supposed to hit the screens on the 18th of this month along with Raja The Great. But the latest we hear is that the film has been postponed by a day and will now hit the screens on the 19th of October. 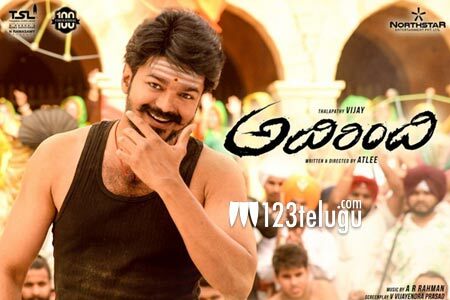 Vijay plays triple roles in this film which is seeing a massive release in Tamil. Samantha, Kajal and Nithya Menen play key roles in this film which is directed by Atlee. Sharath Marar is bringing this film to us in Telugu.